The 7,500 square foot state-of-the-art Clinical Skills and Simulation Center provides a variety of clinical settings for students to gain hands-on experience in order to learn and practice essential skills. 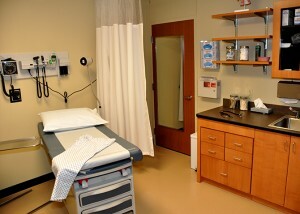 We have sixteen exam rooms that are set up with the medical equipment that you would find in any standard exam room. All rooms are video compatible and have an instructor’s one-way glass viewing station. The Clinical Skills and Simulation Center Standardized Patient program currently employs over one hundred Standardized Patients, including trained Physical Exam Teaching Associates, Genitourinary Teaching Associates, and Male Urological Teaching Associates. Equipped with training simulators and medical mannequins, the Clinical Skills and Simulation Center is used to teach clinical assessment and intervention skills, such as heart, lung, and bowel sounds, venipuncture and catheterization. Additionally, the center provides space exclusively for research and development in virtual simulation technology. The Clinical Skills and Simulation Center serves an average of three hundred medical students on a weekly basis throughout the academic year. We also serve other medical institutions by training residents, nurses, and physicians. The Clinical Skills and Simulation Center also serves outside entities throughout the year based on availability. All outside entities interested in using our facility must do so through our Coordinator and are required to have a Memorandum of Understanding (MOU) or Contract in place adhering to the UCF General Council requirements. The Simulation Lab is not open to extramural activities under any circumstances. For Standardized Patient Sessions, the Clinical Skills and Simulation Center will only use internal standardized patients, PETAs, GTAs, and MUTAs. For giving opportunities, please visit our giving page.